What is the purpose of a holster? First and foremost, a holster must protect the trigger guard, or more specifically, the trigger. Whether or not you’re carrying your gun, it should never just be sitting around with the trigger exposed, be it on your nightstand or in a drawer. While accidents can happen, we must actively do our best to avoid them. And one of the MOST simple gun safety basics is protecting that trigger guard at all times when the firearm is not in active use. The DeSantis Nemesis is a great holster for that purpose. The DeSantis Nemesis is very versatile and low cost / good value holster. Primarily, it’s a great pocket holster, which is how it’s marketed. The Nemesis was designed to comfortably keep a small firearm upright and ready to draw in your front pocket, while adding minimal bulk, and obscuring the outline of the gun for enhanced concealment. However, it’s also an excellent holster in which to keep your small firearm for safekeeping or safe handling – be it in, or, on near the nightstand. The Nemesis is also a quick and easy holster to tuck into your waistband for a quick trek, be it around the house or to take out the trash. 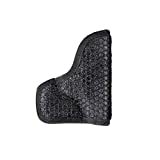 This is a soft holster, constructed of some type of foam material with great viscosity. That means it stays put, be it in your pocket or in your waistband. The soft cloth inside allows for a low-friction draw, while still providing enough retention to keep the gun in place for wear. Glock 42 in DeSantis Nemesis holster, as part of a basic everyday carry setup. Unlike traditional belt-secured IWB holsters, the DeSantis Nemesis relies on its tacky foam outer shell to keep it in place in your waistline. The DeSantis Nemesis grips your firearm just enough to keep it snugly inside the holster, but allows for easy extraction if needed. The retention seems “just right”. As a pocket holster, the very tacky external shell nicely grips your pocket to ensure you pull out your gun, not a holstered firearm, should the situation arise. DeSantis Nemesis for Glock 42 and Ruger LCP. Shown here with their respective companion Spyderco folding knives. The Nemesis is quite comfortable for pocket carry of a small firearm. The tacky material keeps the holster basically in place during normal wear – but if you need to draw your firearm, the combination of the tacky material and extended pocket stability flap of the holster keep it IN your pocket while the firearm comes out. 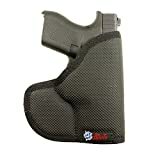 It’s comfortable to wear with shorts, jeans, or slacks, and tends to keep the firearm upright and in place with each. Super loose pockets can be an issue, just something to be aware of. The tacky material also allows for a companion tool (such as the folding knives shown above) to coexist in the same pocket, while staying in place. Incidentally, a small folder like that also tends to help break up the outline of the gun in your pocket. For Inside The Waistband carry, the tacky outer shell is surprisingly ok to wear. I’ve seen no problems with extended wear, no irritation, etc. Versatile holster, useful for pocket carry of a small firearm. Also good for simple Inside The Waistband carry. Holster is open at bottom, meaning moisture won’t collect and harm the finish of your gun – or cause rust and damange on the internals. When used appropriately and with an understanding of what this holster was designed for, we have not really found any cons to date. As this is a soft material holster and there is no mechanism for truly securing the gun inside the holster – or fixing the holster in place for wear – take great care carrying a loaded (chambered) firearm. With any new holster, we strongly recommend wearing your gun un-chambered (no round in the chamber) until you have a gained a solid understanding of your new holster’s features and function in various life scenarios. Short version – stay extra safe while getting to know your new holster. And as always, do NOT re-holster a firearm into a pocket holster or Inside The Waistband holster. Remove the holster and re-holster the firearm safely and with great care. The Nemesis material and design is similar to the Remora sticky holster, as well as the similarly named Sticky Holsters . At this time, we have not yet evaluated Sticky holsters. However, compared with the Remora, I prefer the DeSantis Nemesis both for the texture being more comfortable on skin, and for being a bit more compact (thin). Also, the Remora has an enclosed bottom and I prefer open for better ventilation, to prevent moisture build-up. The DeSantis line of pocket holsters includes a number of other holster options worth checking out. One of them which is very similar (and could be considered the natural evolution of the Nemesis) is the newer Super Fly holster. The Super Fly comes with an ultra concealment optional flap that attaches by velcro and completely obscures your firearm, making it look more like a large phone – which is a really great idea. I would have loved to see this option on the Nemsis as well. The Super Fly is also constructed from an enhanced foam which is more tacky and grippy than the Nemesis. However, in our testing we prefer the Nemesis because the Super Fly foam is thicker and adds a little more bulk compared to the Nemesis. If you don’t mind a little extra bulk in exchange for better grippiness, the DeSantis Super Fly may also be a good option for you. That said, we’d love to see the Super Fly optional flap become an option on the Nemesis as well. The DeSantis Nemesis is a great holster to have, even if you already have more elaborate Inside The Waistband holster. I find it easy to grab and put the gun in quickly, even if you don’t have the time to connect it to your waistband. Get yourself a DeSantis Nemesis. For a small gun like the Glock 42, Glock 43, Ruger LCP, Kel-Tec P32, etc… it’s a must-have.